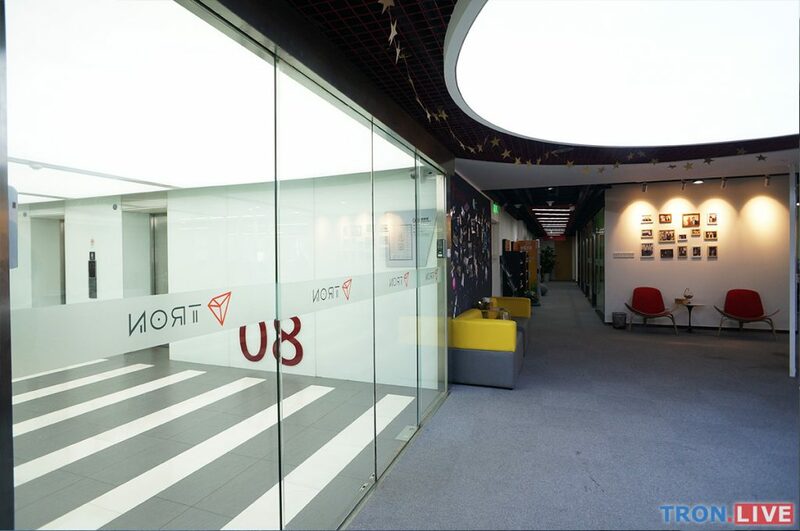 In this post, we will continue our journey to the upper floor of TRON Foundation’s Beijing Headquarters which is on floor level 8. 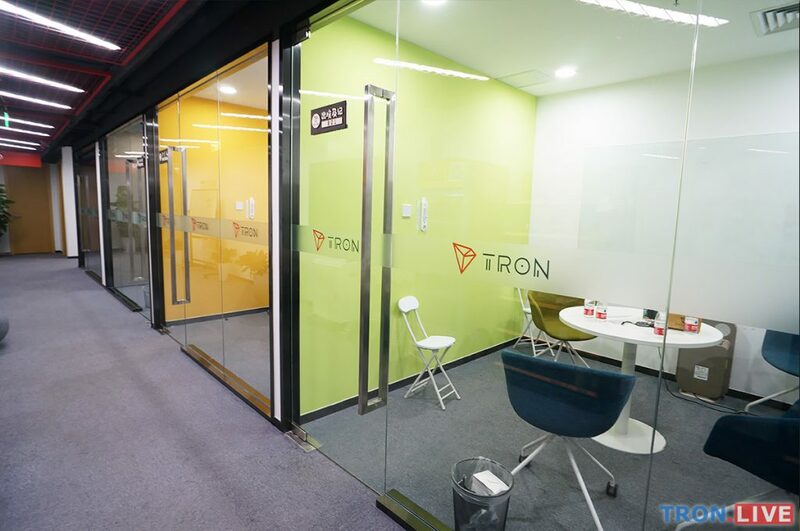 For those who missed the first part of this post, make sure to check out A visit to TRON Foundation’s Beijing Headquarters. 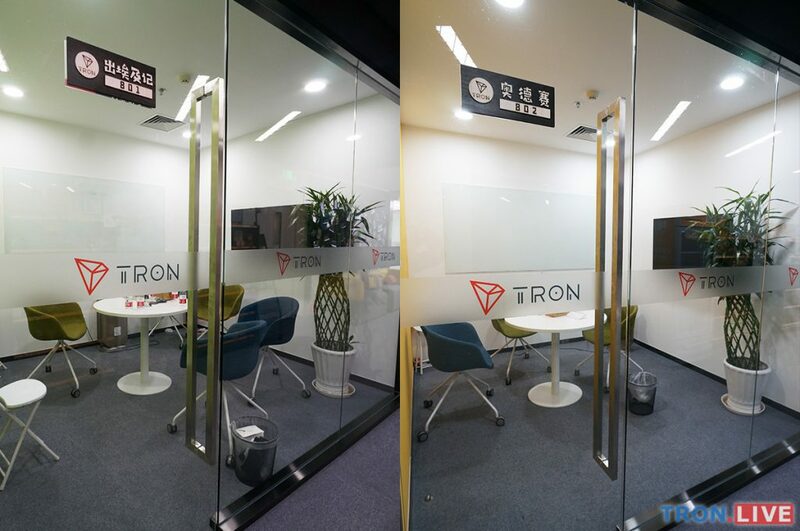 Main entrance of TRON office on 8th floor. 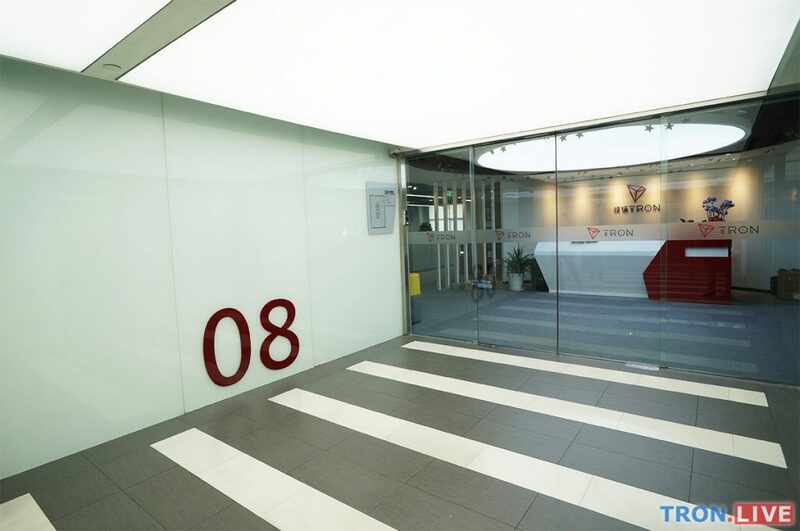 Similar to entrance on floor level 7, the entrance of 8th floor is also guarded with an electronic card access system. Let’s head in and check out how this floor looks. TRON reception desk on the 8th floor. A classy reception area which was recently loaded with packages when we arrived. Lil’ Tronbeary is on the desk to welcome guest. Left side of reception desk. Right side of reception desk. The left side of the reception desk has a TV which features Justin on TV shows. The right side of the reception desk has a photo wall and a wall art next to the glass door entrance. 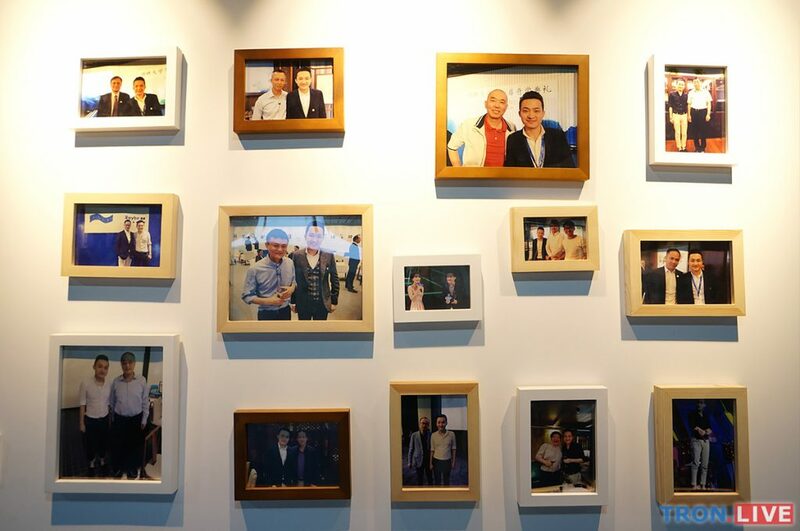 Photo wall of Justin Sun with famous peoples. TRON wall art in reception area. Next to the photo wall is a walkway to a row of small rooms. 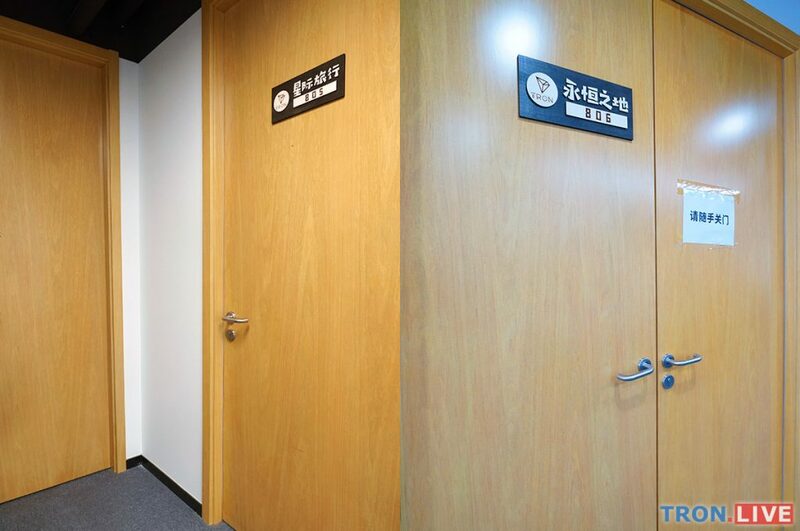 You may have noticed that these rooms have names on the room number signs. See if you can guess what these names mean. TRON small rooms next to the photo wall. TRON room 801 & 802. TRON room 803 & 804. TRON room 805 & 806. Room 806 is actually on the other side of the building but included here for completeness. 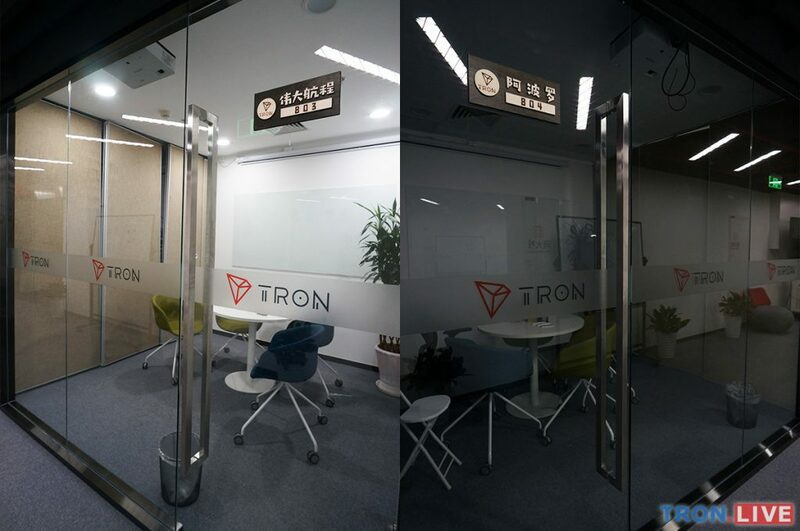 The 6 rooms shown above are actually named after the 6 main stages of TRON’s technical milestones on its roadmap. Stage 6: Eternity 2025–2027 (Entertainment platform crowdfund for developers). 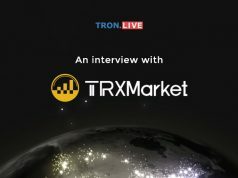 Hope the quick summary above will give those who are new to TRON an insight of TRON’s development plan. 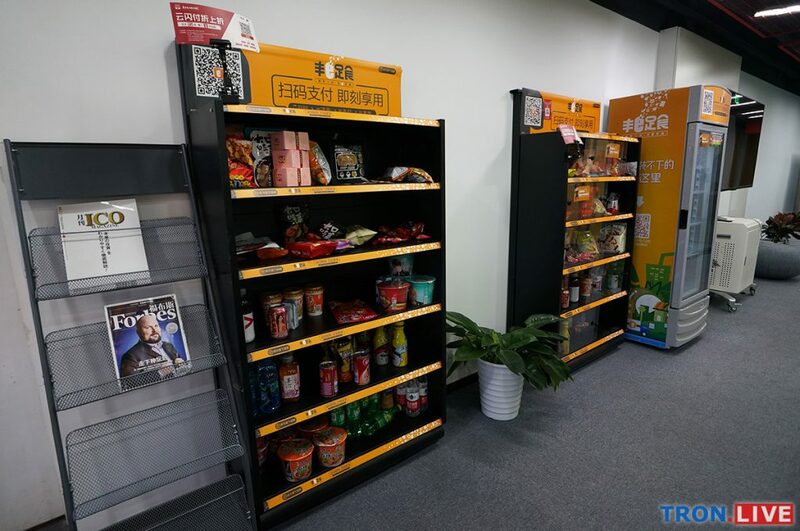 On the opposite of room 801-805 are a number of self-help snack counters from a third party snack provider where employees can use their phone to scan and pay for items. Third party snack and drink self-help counters. 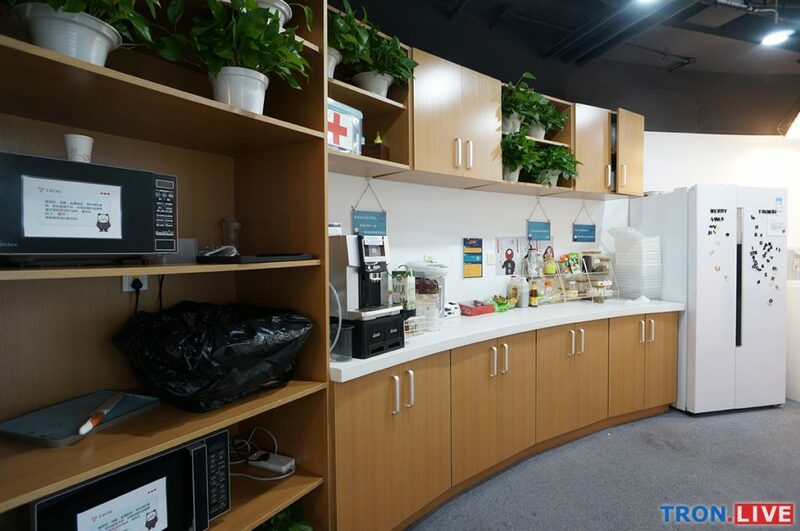 Employees can also get more foods and drinks in the pantry, which is located just behind the reception desk. The pantry area on the 8th floor has a semi-circle layout. Fresh fruits will also be served every day after lunch. Pantry on 8th floor is well-equipped. Condiments, coffee and loose tea leaves readily available. Small dining area in pantry. 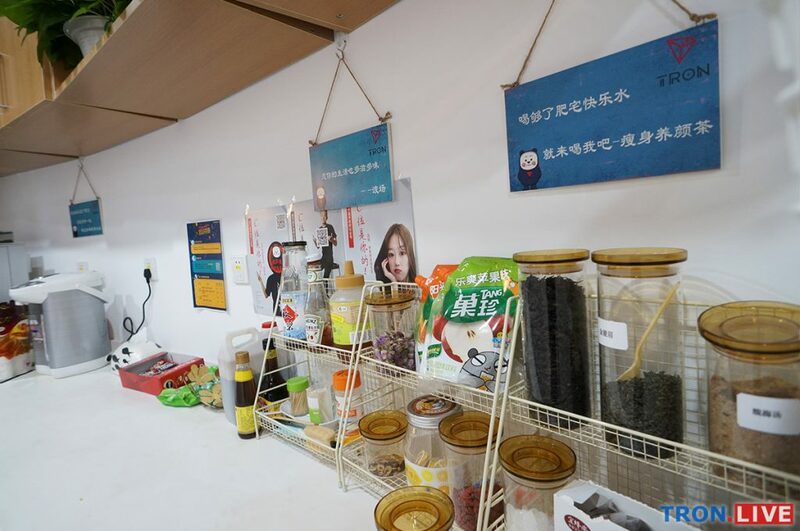 This pantry is decorated nicely with some great looking posters and cheerful hanging signboards. For example, the signboard above states “Eat more, then you will weigh more in my heart”. Now, let’s head over to see the workplace on the 8th floor. As you may notice on the clock shown above, it was close to noon time while we took these photos so a lot of the employees already went out for lunch. Comfortable-looking workspace with sitting area on one side. Various workplace views on the 8th floor. More workplace views on the 8th floor. 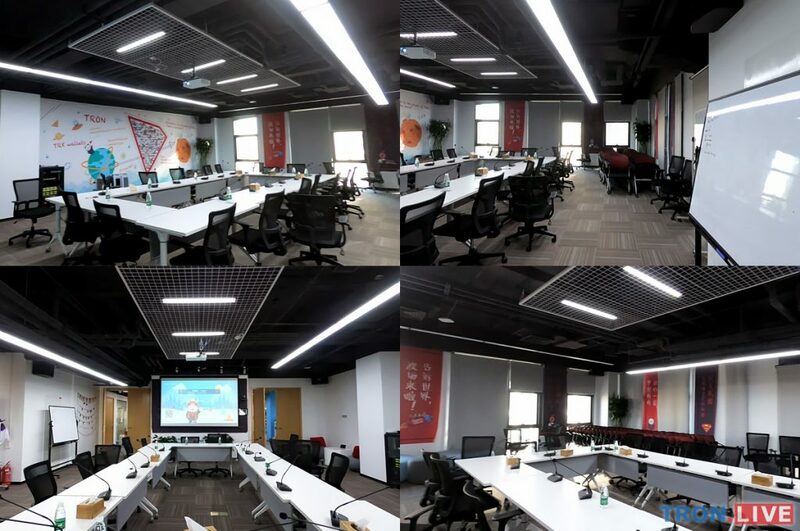 There is also a big presentation room on the 8th floor of TRON Foundation’s Headquarters. This is room 806 – the Eternity room. Presentation room/meeting room on the 8th floor. 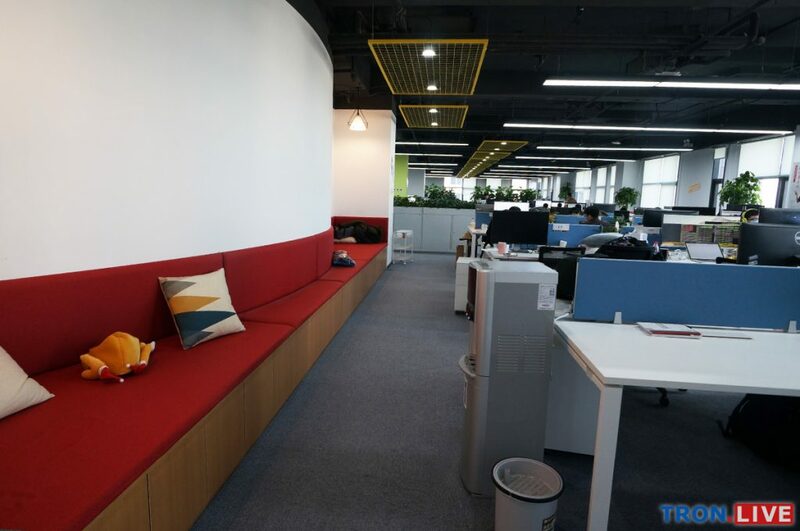 On one end of the building, employees can take a quick rest on the Japanese-style tatami or have some comfy massage with the massage chair. There’s also a dining area close to the massage chairs for employees to take some quick bites. Resting area on 8th floor and view from above. Still feeling the tension from work? Head over towards the other end of this floor and knock your stress and pressure out! 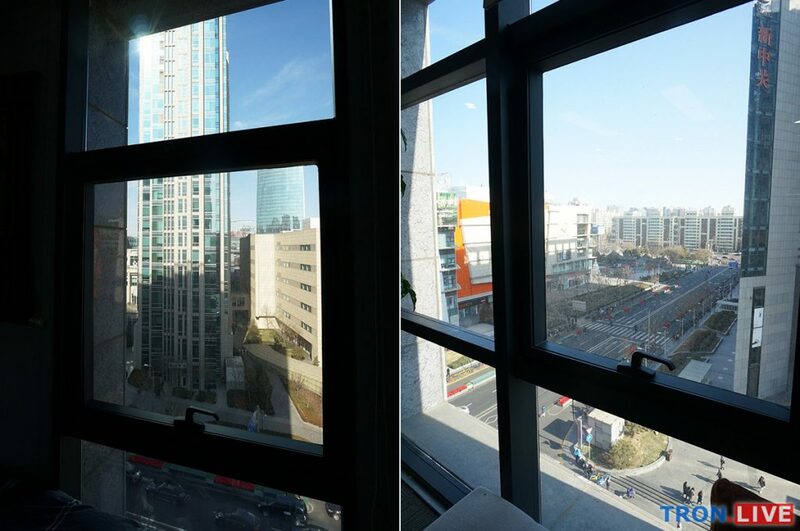 On the other far end of the 8th floor is what a lot of Tronics are looking forward to seeing – Justin Sun’s office room/bedroom! His room is secured with a biometric fingerprint scanner. Open Sesame! 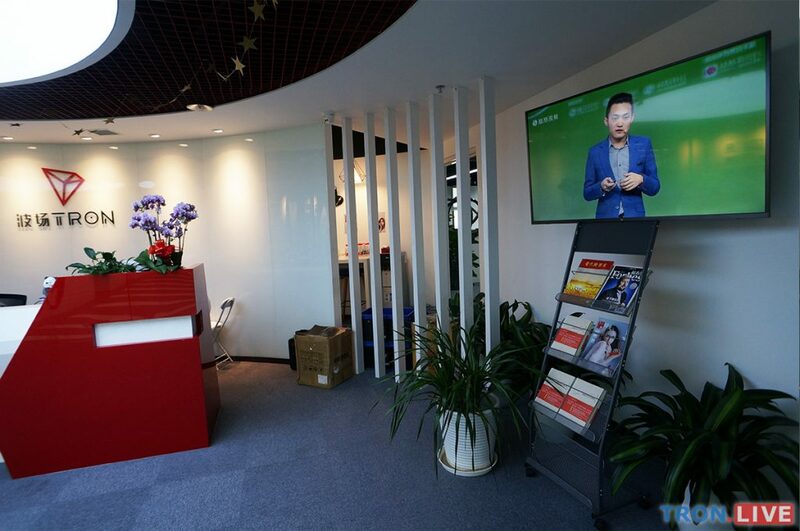 Entrance of Justin Sun’s office room. 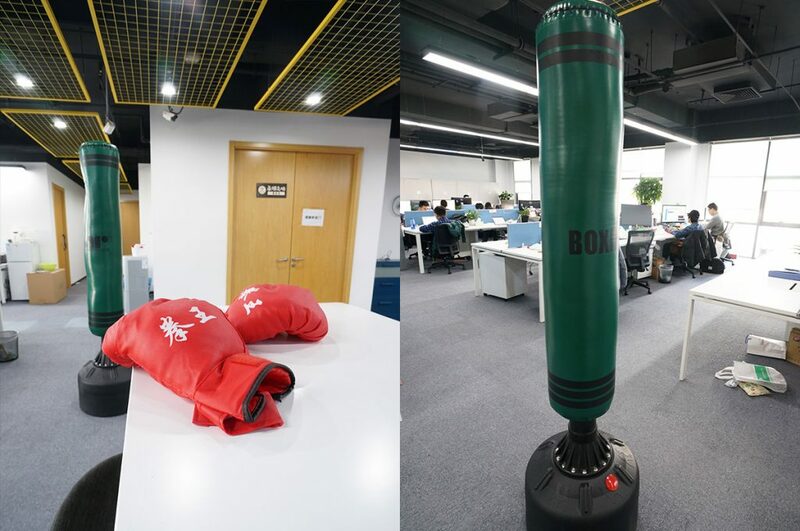 Interior view of Justin Sun’s office room. 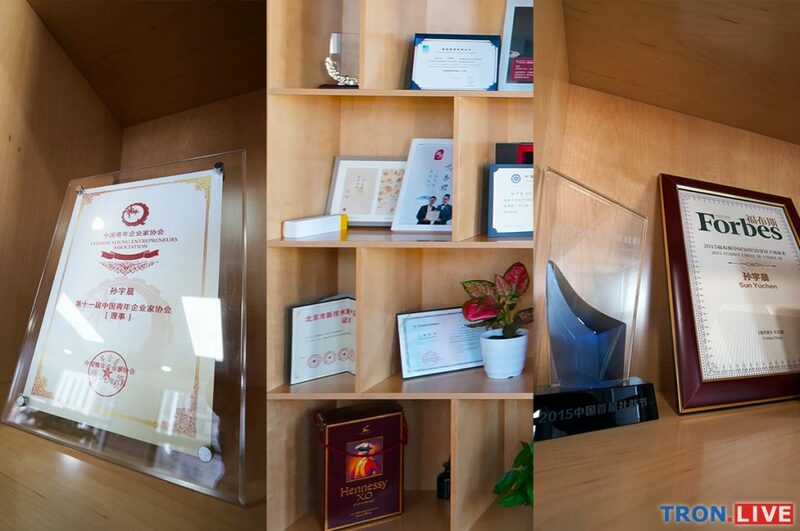 Some of Justin Sun’s awards and certifications. 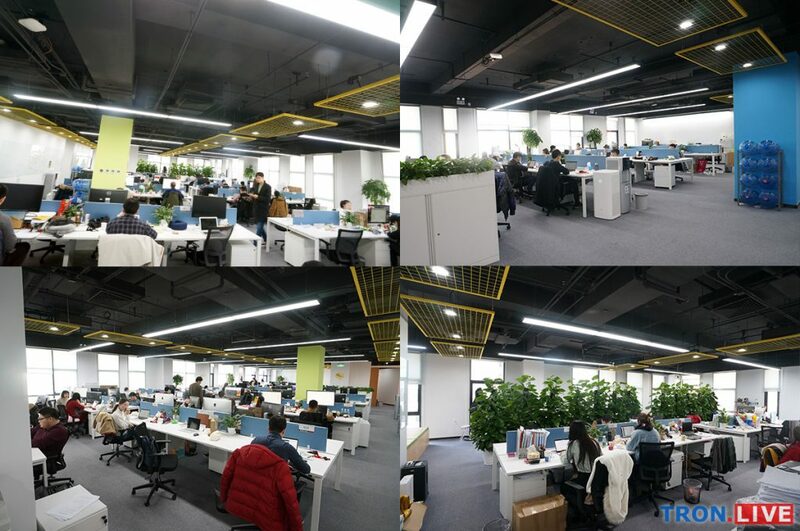 Looks like an ordinary office room, right? So, why do we mentioned it’s also a bedroom before? The reason is that we purposely hid something from view on the office room photos above. 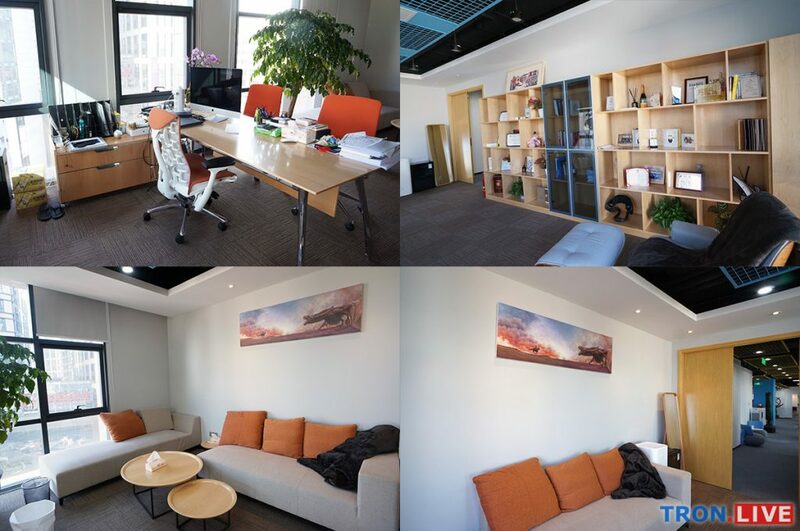 Here are some clearer views of his office! 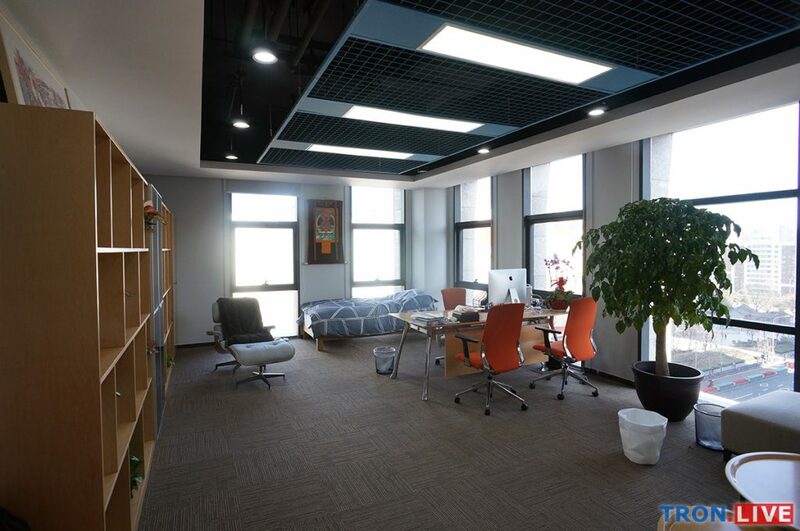 Wider view of Justin Sun’s office room. 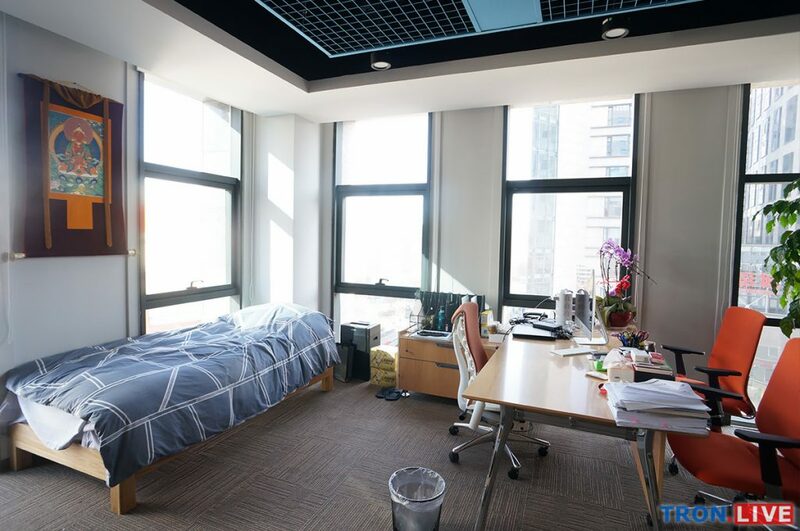 Single bed behind Justin Sun’s office desk. Views from Justin’s office bed [left] and office desk [right]. Yes, that’s right. There’s a bed behind the office desk. From the words of TRON employees, Justin is a really hard working employer and sometimes he will stay up working late hours and sleep in his office bedroom if needed. Kudos Justin! Seems like you are really determined and passionate about your work. Like the wise saying “Successful entrepreneurs are abundantly passionate”. 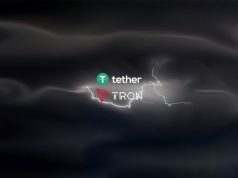 This is definitely good news for TRON supporters. That’s it for the introduction of Justin Sun’s office. 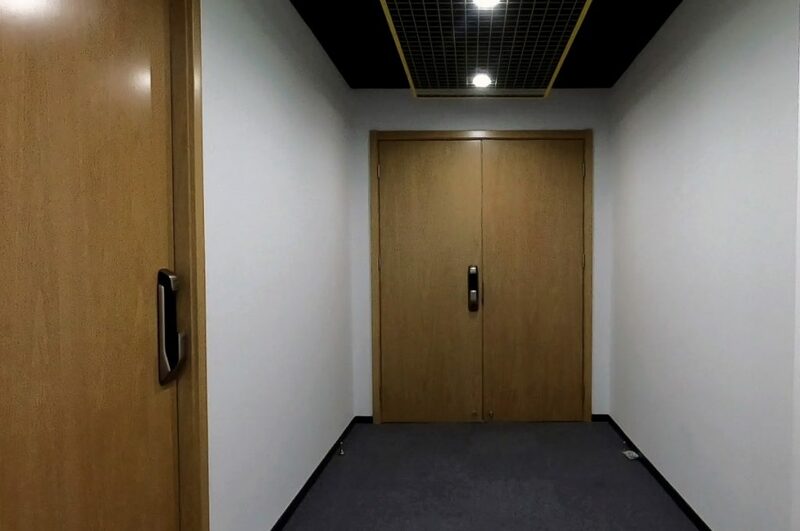 If you have been spotting closely, you will notice the 8th floor is also decorated with nice decorations and signs so it doesn’t look like a typical plain old boring office environment. Nice decorations on the 8th floor. Small decorations and fun signboard. 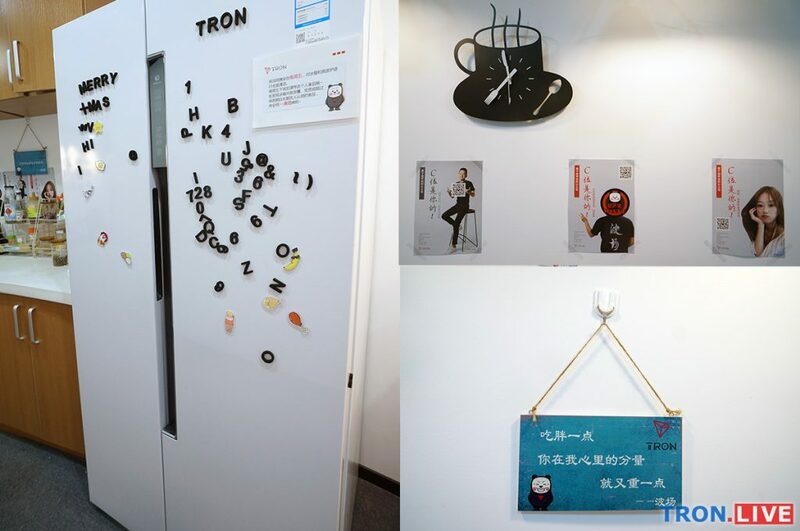 You will find various fun and creative signboards across the office. 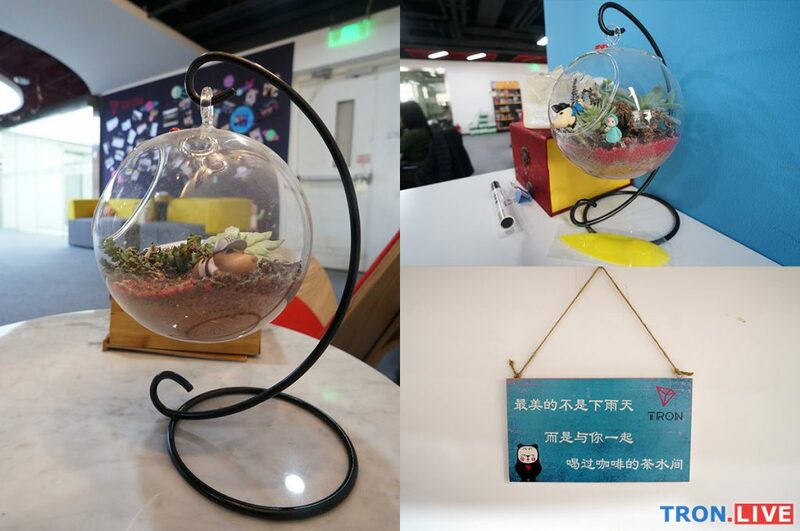 For example, the yellow speech bubble on the photo above states “Your code is beautifully written!” and the blue signboard above which is hanging in the pantry states “The most beautiful memories are not the rainy days, but the times we spent drinking coffee in the pantry”. Today’s business environment demands innovation and creativity more than ever. 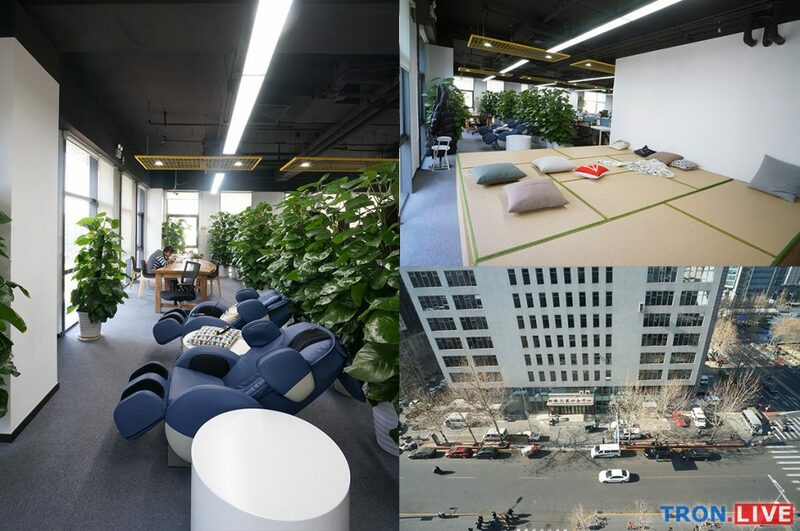 We can see that TRON Foundation’s Beijing Headquarters tries its best to draw this innovation inspiration from a number of everyday creative sources in employees’ workspace. 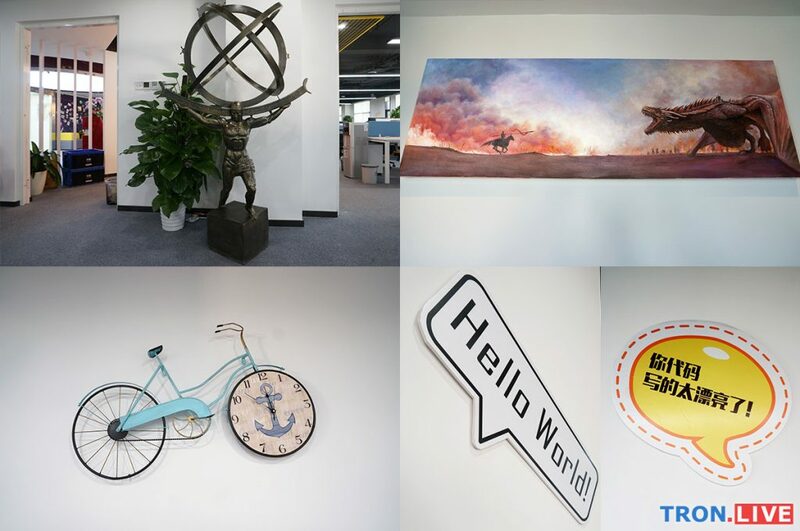 We are sure that this fun and creative working environment will increase productivity and ultimately leading TRON closer to its vision – to decentralized the web! 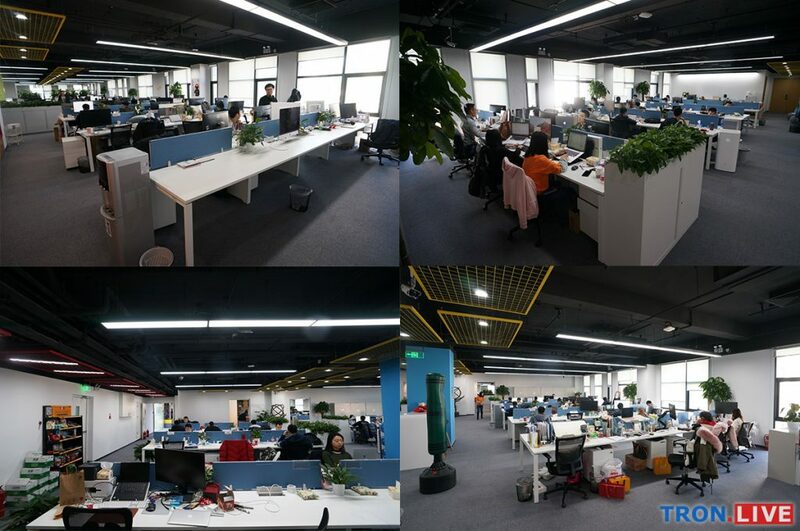 During this trip, apart from taking photos and videos of TRON Foundation’s Beijing Headquarters, we also had some discussion about TRON online store. 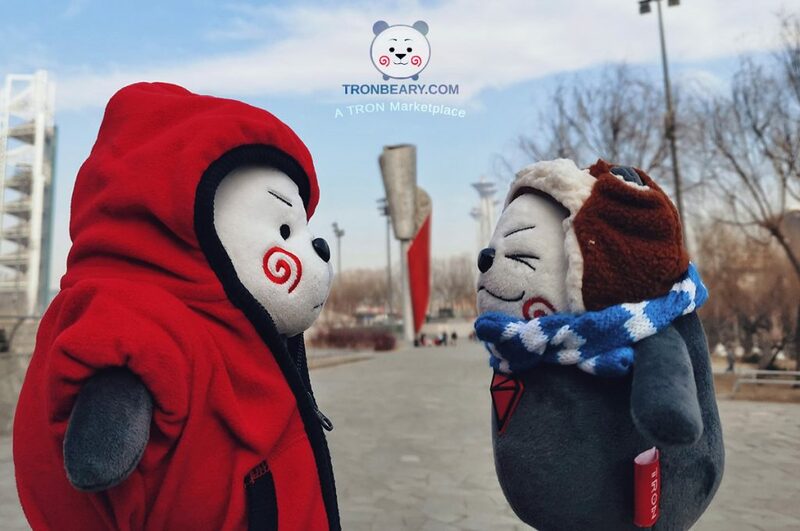 Due to popular demand from Tronics, TronLive also brought back some Tronbeary and official TRON merchandise so supporters outside China can get these items too. We will be listing them on Tronbeary.com which is coming soon! To foster the adoption of TRON transactions, we encourage more Tronics to buy and sell TRON products using TRX and TRC20 tokens. If you have any custom-made TRON related goods for sale, do reach out to us and we will make it available for the public if it meets the quality criteria. 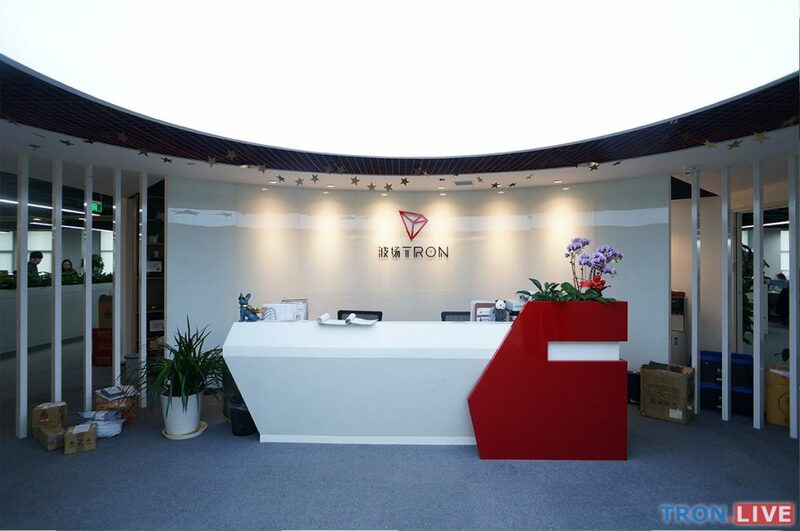 That’s all for the introduction of TRON Foundation’s Beijing Headquarters! 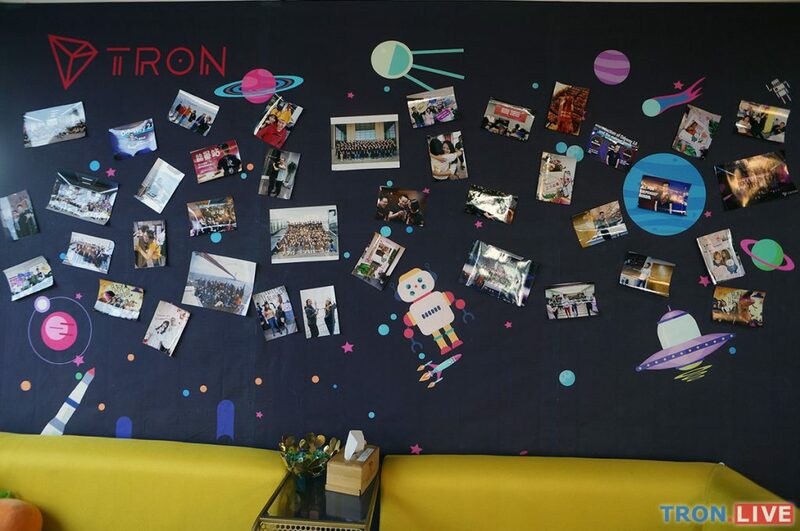 We hope that this post will give you more insight into TRON Foundation and how they operate. It will surely combat a lot of FUD (Fear, Uncertainty, and Doubt) as there are a lot of crypto projects out there raising funds from ICO but don’t have a proper workspace or employees after many months. This rapid expansion of TRON will surely make TRON become one of the top crypto projects one day! 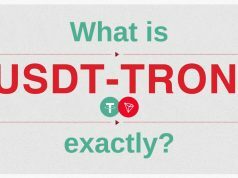 Previous articleWhat is USDT-TRON exactly?